Although I am not quite out of debt yet, I have taken an important step and created a number of savings accounts for longer term goals (though not as long term as retirement). I have found that there are many expenses in my life that I know darn well are coming up, but through denial and procrastination I never budget for them. By creating many savings accounts for these regular yearly expenses, I have alleviated the need for credit cards and stress. Step 1: Decide what your yearly expenses are that deserve attention. I listed mine below and suggested a few others. Step 2: Go to Ally Bank online (I like Ally but there are others; you can check them out here) and set up as many savings accounts as you like; it’s free. I have 4 accounts with them, and deposits are automatic each month since I linked them to my checking account. New Car: I deposit $150/month. If I can get 2-3 more years out of my current automobile, I can trade it in for $2,000 and I will have up to $5000 in the savings to purchase a car for $7k cash. Then the savings starts again; Wash, rinse, repeat. Beats the hell out of a car payment. I will always pay cash for my cars from here on out. Property Taxes: $100/month. My Vemont home’s property taxes are $1200/year. This year I didn’t freak out; I wrote the check and done. Emergency Fund: $100/month. My wife has an emergency fund for us. This pads it slowly but surely. Car Repairs: $50/month. For repairs on my current car; Not to be mixed with the new car payment. Comes in handy, especially when you know you will need tires or some other job every year or two. Holiday gifts (hey, $100 a month hurts a lot less than the credit card bill you rack up at the end of December. You know this expense is coming, so plan for it!). Step 3: Link the savings to your checking and automate the payments. The transfers should come out on the 1st of the month (or on the day you normally get paid) so that it is easier to pretend the money never existed. Step 4: Pretend the money does not exist and stick to the plan! If you feel the need to withdraw the money, you need to go back and tweak your budget and/or your spending habits. Creating these savings accounts has changed my life. I used to throw all of these expenses on a credit card. I mean, we all know Christmas comes every year, and every year I saved no money for it! Are there any expenses I missed? 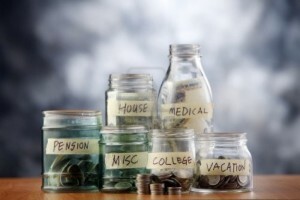 What would you label your savings accounts? Please feel free to add some in the comments section! If you liked this post, please share on Facebook, Digg, StumbleUpon, or your favorite service. I would appreciate it!